More and more people are using their cell phones instead of computers and laptops these days. You are probably doing it yourself, I know I am! There are days now where I don’t even use a computer at all and do what I need to do on my phone, it is faster and easier to do a Google search on my phone for sure. So with all these people now using their phones, with smaller screens, it is a very good idea to make sure that your website is fully mobile ready. Your full website might load in a half second over your super fast home internet on your computer but on a phone on a cellular connection it can take some time, and in today’s web world people don’t have time and will not wait for a heavy site to load on their phone. Every cell phone, android, iOS, etc’s browser has what is called a User Agent built in that tells a website that it is viewing from a mobile device with a smaller screen, we can use that as a switch to show a mobile style on your site. A mobile style is lighter, it loads faster, it is less cluttered and easier to read, and it also fits side to side on the phone screen, this is important to mobile browsers. Often times the menu system will be configured differently so it is easier to use with a touchscreen rather then a mouse, lastly we include a “switch to full site” link in the footer for people who prefer to use the full site on their phone. 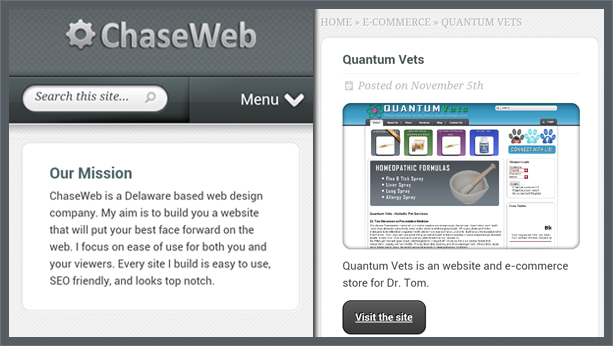 To bring your site to mobile, contact us today.